Laura Conowitch from LC's Cottage has invited me to join the "Around the World Blog Hop". Since she's not the first person to ask me, I thought I'd say yes and actually post this time. Yes, I'm afraid to say I totally spaced out on this blog hop when Laura Davies of Tanderwen Quilts asked me to join in. Since this isn't one of those chain letters promising dire consequences for not passing it along, I have not come down with boils, the plague, or lost all my meager wealth but I figure I won't tempt fate (Ha!) again. This blog hop has been making the rounds for some time. Anybody know who started it? The idea is to answer 3 questions and recruit 3 more people to share on their blogs the following week. I am always working on more projects than I can ever complete. I know I'm not alone in this, but I have seriously got to get a handle on my WIPs. Finished this up last week! I have another applique project that I could finish up in time for the above deadline, but the other idea has taken over my brain. I am also working on a special project that I can't get too specific about. Possibly because I might just give up on it. I am always working on my blog and Youtube channel, trying to keep folks informed, encouraged, and possibly entertained. There's several small projects in the works as samples for the shop that I work at one day a week. Made this for the shop too! That's enough for now on what I'm working on. I will also add that tomorrow my baby turns 5! Five whole stinking adorable years. I can't believe it. How does my work differ from other’s of its genre? Let's see.... I've mentioned before that I'm all about the quilting, so you won't see a lot of piecing from me. I am what some people call a "Pantser" which means I tend to fly by the seat of my pants and wing it. It's part of what contributes to my creativity, and is an excuse for my many works in progress. I like to do things that don't require a lot of precision or math. 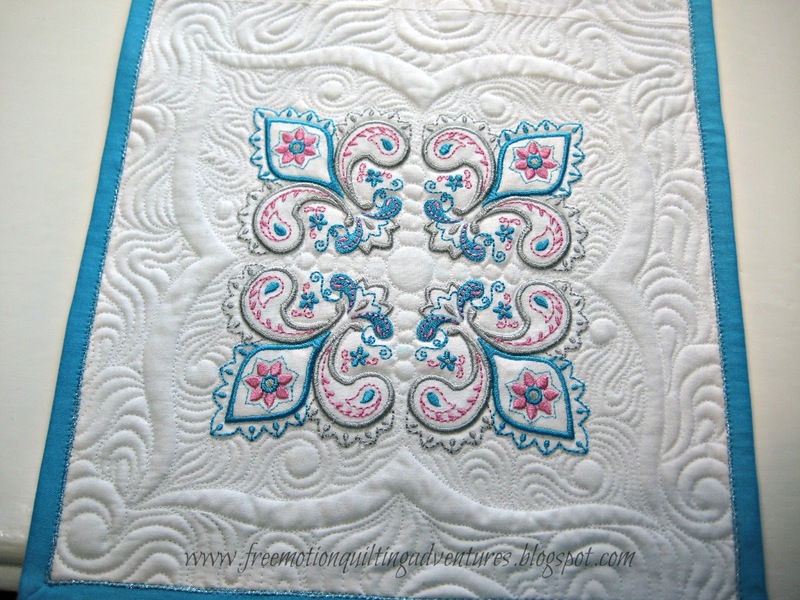 I love, LOVE the 'free' in free motion quilting! Some might call me an art quilter for a few of my quilts, but I've seen real art quilters and that's not really me. I'm not a traditionalist, given my lack of piecing but that doesn't mean I'm a modern quilt gal either. I'm somewhere in the middle of all of it. I like to think of myself as an artistic quilter. I love sharing my creative quilty adventures because I hate to hear someone say "I can't...." Whatever the creative endeavor, I want folks to do what they want to do and not worry about what others think or whether they've got the latest and greatest machine, tool, or gimmick. When it comes to FMQ, the biggest factor in success is how much quilting you do and your perseverance in figuring out what works for you. I also like the social aspects of quilting and blogging. I am quite the introvert and shy and the internet makes it easier to put myself out there and meet new people without feeling like I need to hide in a closet to recuperate. To step out and write, share my projects, shoot a video and to get such wonderful feedback (except for the few dislikes I get on videos, sigh....) from folk all over the world isn't just rewarding for me online, but it has also helped me be more confident in person too. My creative process is fueled in part by panic. Well, not exactly, but that's when I get productive anyway! I shared a little about my process yesterday. Inspiration comes and goes, but when it's flowing, it's wonderful. I get inspired by colors, music, or just an itch to stitch. But like any talent, it truly grows when you slog through the less inspired bits and push through til the idea comes to fruition. I know people like to read about other people's creative process, and I've not gone into mine much. But that's because it really just kind of happens. I haven't been at this long enough to recognize the details and stages of how I work. I do know that I am my own worst enemy when it comes to a project that pushes me out of my comfort zone. What a negative inner voice I can have! But I also know that pushing past that negativity and stepping out of my comfort zone is when I really grow creatively. From a practical standpoint, my process usually involves a sketchbook, graph paper, followed by some computer tweaking if it's a major project, and almost always freezer paper. That's it for the questions. I neglected to line up 3 victims participants ahead of time, so I invite any of you to volunteer to answer these questions. Let me know in the comments and I'll update this post to link to your blog! Aww...you are so sweet for telling me! Thank you! It's so interesting to know more about you, boils or not! 😄 Your quilting is inspiring. I even like your "open" sign! Maybe you don't like Joann's Kona because it isn't Kaufman brand. Kaufman Kona is my favorite solid. I do like Kona for some things (quite a few things, actually). Especially fabulous as a background fabric. It's my understanding that Joanne's does carry the Robert Kaufman Kona and that they have said that they are not marketing a separate version to Joanne's. (I know there's rampant speculation about this on the interwebs) But it's a tad thick for my turned edge applique (In my own opinion) and while I am a confessed not-so-perfect piecer, I don't like the adjusting of my 1/4 inch seam when working with Kona to keep everything measuring out where it needs to be when I DO want to be accurate.